Domovanje Review 2019: Is Domovanje a Good Hosting? Slovenian web host, Domovanje, has been around since 1999 and is the largest hosting provider in Slovenia. Its services include shared, VPS, and Windows Server plans, all using fast SSD storage. There’s a staff of 45 employees handling operations, having served over 90,000 customers since inception. The website is in Slovenian and English. Slovenian web hosting company, Domovanje, has been serving customers since 1999 and is the largest provider in its region. It specializes in shared and VPS hosting as well as domain registration. The website is in Slovenian and English, however the knowledge base is in Slovenian only. Its servers are located in the capital city of Ljubljana, Slovenia. WordPress users will appreciate the one-click software installer. Anti-spam protection is also included with all plans, as are free SSL certificates (except for Windows server plans). If you were hosting with another provider previously, Domovanje will transfer your data for free. As stated above, the entry-level “Post-office box” shared hosting plan is a starter option that has limited features and data allowance. But, the next option up really has more value for not much increase in price. With this level, bandwidth and storage increase to unlimited, as well as unlimited email accounts and unlimited MySQL databases. Additionally, this plan (and higher) come packaged with over 200 applications at your disposal and a free credit towards Google ads. In terms of building a website with a CMS like WordPress, the plan you choose with Domovanje will determine if that’s possible. You won’t be able to host a CMS on the lowest priced shared plan at all. Stepping up to the next two levels will allow WordPress and Joomla. But, you’ll need to upgrade to the “Store” plan if you want to run a Magento or PrestaShop online store. 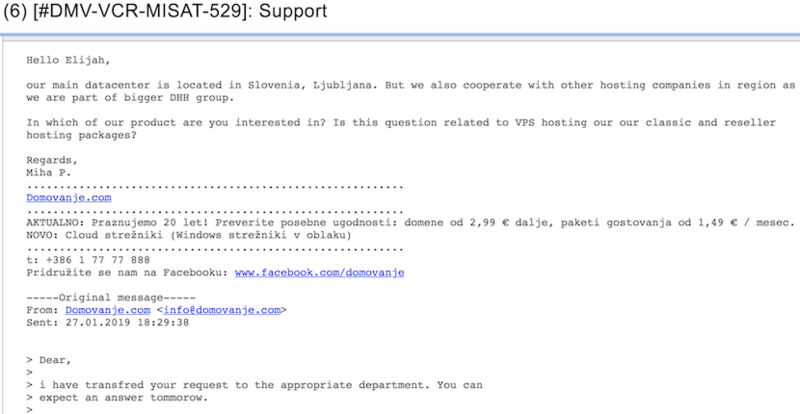 Pricing for Domovanje is very competitive and comparable with the lowest priced major Slovenian, and European web hosts. Shared plans cost less than a cup of coffee and for that price, come loaded with impressive standard features such as SSD, free SSL certificates, a 60-day money-back guarantee, and more. Plan payment options include every month, six months, 12 months, or multi-year. The 60-day guarantee is higher than average and Domovanje gets bonus points for that. Customer support is available from 8:00 a.m. to 8:00 p.m. via telephone and email. And while that may not be 24/7, my email to support was responded to within about 15 minutes during Slovenian business hours, which is pretty good. Web hosting customers will appreciate snappy customer support like this. Domovanje is Slovenia’s largest provider of web hosting and has a very good online reputation to back this up. Its shared, VPS, and Windows Server hosting plans are priced very competitively. SSD storage, free SSL certificates, and the 60-day money back guarantee tip the scales in favor of Domovanje being a very solid web hosting provider for this region. Wondering how Domovanje stacks up against other Web Hosting companies? Enter any other Web Hosting company and we will give you a side-by-side comparison.